Have you seen the latest awesome By Hand London pattern? It’s the Kim Dress, a feminine design perfect for making gorgeous party dresses – released just in time for the holiday season! 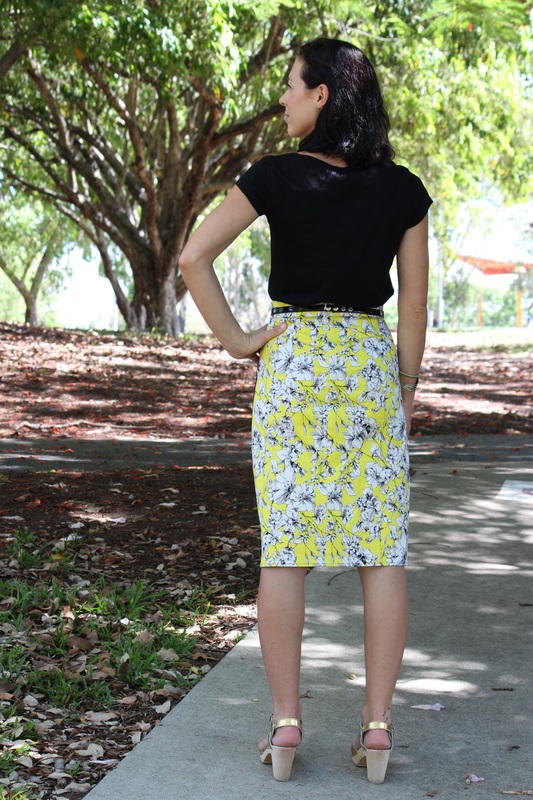 I’m head over heels about the faux wrap tulip skirt and I knew I wanted one ASAP. I didn’t plan to sew up this merry and bright Xmas little number, but the other day I was in search of inspiration and found this amazing fabric laying around in my stash and thought it would look good as a Kim. To be exact, this cotton sateen was given to me last year as a Xmas present and it was already sewn up in an overly big dress, so I’ve decided to rip it apart and make something wearable with it. 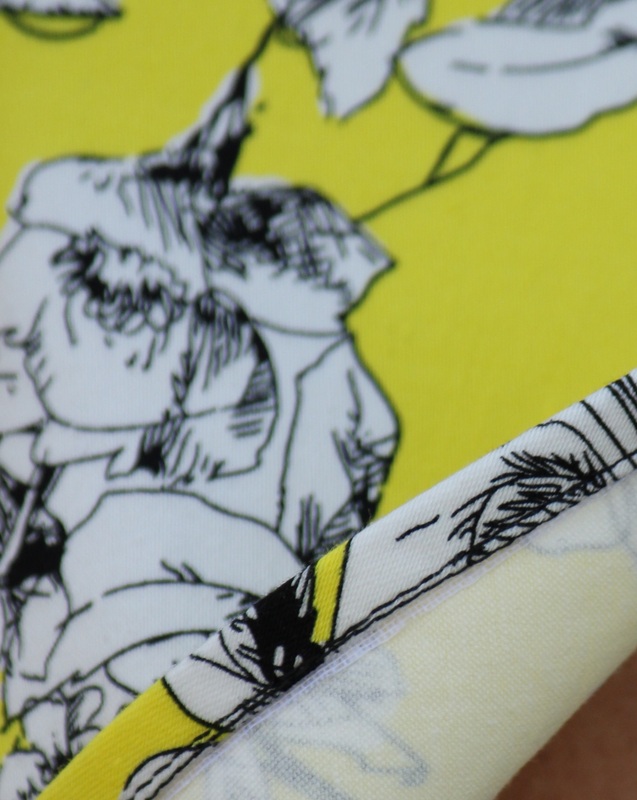 I really like the print – I’m not a yellow gal at all, but the addition of black and white flowers is probably what changed my mind about this material. Of course the amount I had wasn’t enough for any of the skirt styles I like at the moment, but with the help of some black cotton sateen, I was able to pull out a Kim skirt. I basically cut the front under layer panel out of the black sateen and sewn everything together as per instructions, adding a three pieces waistband – the amount of yellow fabric I had left wasn’t long enough to make a single piece waistband, so I added seams at the sides and used every bit of material I had. Maybe next time I’m gonna try a narrower or contour waistband, this one gaps slightly, being straight, but I’m not too worry about it. I traced a size 8 for the waist going down to a 4 for the hips and once I tried the skirt on, I’ve decided I could easily have cut a 2 for the hips instead, as I had to take in about 1/2 cm at each side. I don’t usually like pencil skirts on me, but I like the fun high low hem and faux wrap of this pattern and I think I look OK in it. Now, let’s talk about the fitting issue you can all see here and which I didn’t bother altering before cutting into this awesome fabric. I didn’t bother, that’s it, all my fault, but I can live with these imperfections and wear this skirt anyhow. Sway back. Flat derriere. Call it as you wish, I have excess fabric at the back, just under my waist that makes the skirt puff up and look funny, as if I’m wearing a baby nappy. I could easily unpick the seams and zipper and fix the problem, but if I pull the skirt up when I wear it, it sorts of looks OK so at the moment I’m happy with that. Surely the next Kim will be altered accordingly, thought. Do you think I should deepen and lengthen the back darts too, just a smidge? I guess I need to sew a quick muslin and see what happens. And here it is the back, jeez I love this print! In order to have a nice and crisp front curved hem, I’ve fused a strip of stabilizer to the seam allowances straight away after cutting and I’m so happy I’ve done so – the curves maintained their shape beautifully and no fussing around was needed when hemming. I’ve also hand stitched the upper section of the overlap to the under layer, to avoid unwanted legs and undies flashing. The split is still prone to fly open at every slight blow of wind or long step and probably it would be a good idea machine stitch it next time, for more strength, at both sides. I would have done so on this skirt already, but I didn’t want a double black stitching line on top of the yellow background, it would have been too visible, so I did it by hand instead. Here it is a pic of the skirt in action. I’m already planning more Kims and I’m curious to try this pattern in a different fabric, with a softer hand and more drape, for a dramatic effect. I’d love to find some nice velvet, but all I can see around is just ugly polyester crap, not good to me. But I do have some coral lyocell/linen blend waiting for the right project. Or maybe I could sew a knit version, without zipper and encased waist elastic instead? Or try to create a real wrap skirt, moving the closure to the side front? Too many ideas and not enough time, that’s the real problem! I’m off to enjoy the sun now – the weather has been gorgeous during this holidays – have a great end of the year everybody and happy 2015! Previous Post Merry and Starry Xmas! Thanks Lisa! I used to hate concealed zippers too, but everything changed when I bought the invisible zipper foot. The task is now taking only few minutes and the results are almost perfect! I love Kim as a skirt, it so pretty. The colour blocking was a great idea, your whole outfit is just perfect. A knit version is a great idea, I hope you end up making one soon. Thank you! I’m not very confident with knits yet, but the idea of sewing a Kim in a lovely Ponte or super soft jersey is very appealing…. Thanks! I really love this print too!